Advanced Dungeons and Parenting: Is it Explosively Good? A Review of Brian McClellan's POWDER MAGE Role Playing Game. Is it Explosively Good? 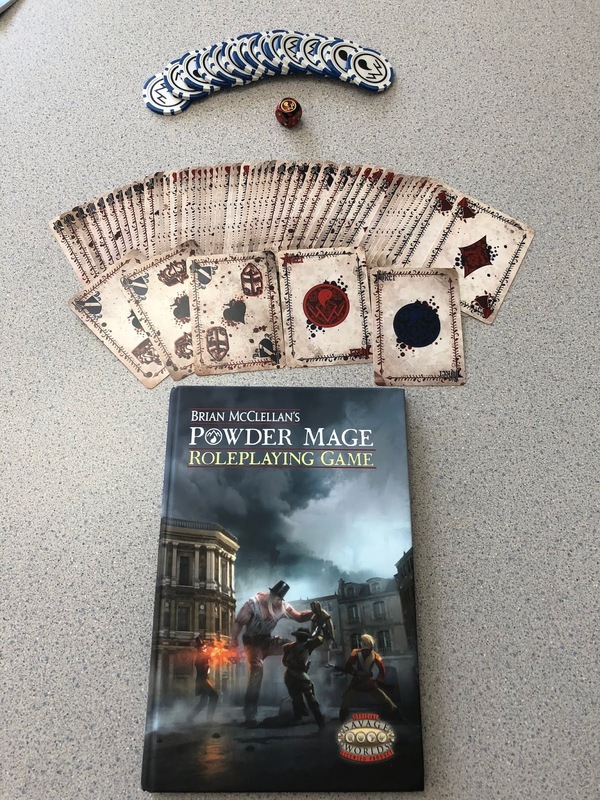 A Review of Brian McClellan's POWDER MAGE Role Playing Game. Readers of my posts here at Advanced Dungeons and Parenting know that I am a big fan of the Savage Worlds role playing game. It's an easy to learn and simple to play game that is remarkably flexible. This flexibility allows the Savage Worlds rules set to be used as the basis of games set in a wide range of genres. The system can handle everything from gritty low magic fantasy to cosmic powered super heroes without missing a beat. The characters from each campaign may not fit well in the other campaign due to scaling issues, but the mechanics work seemlessly in each setting. I am also a fan of Brian McClellan's Powder Mage trilogy and was hooked from the first few pages of The Promise of Blood (link goes to the Mysterious Galaxy bookstore, one of the best independent book stores out there). McClellan manages in the trilogy, and later books in the setting, to achieve something rare in fantasy fiction. He is able to tell stories of "regular folk" in addition to the epic heroes at the center of the tale. From a role playing game point of view The Powder Mage trilogy alternates point of view characters between characters at vastly different power levels, but the lower powered characters are as important to the resolution of the conflict as the most powerful characters. It is one of the most impressive things about this inventive series, and it is something that makes it perfect for the Savage Worlds system. Before I get too deep into a review of Brian McClellan's role playing game adaptation, I'd like to take a moment to discuss the particular challenge anyone adapting The Powder Mage trilogy into a game faces due to the varying power levels in the tales. As I mentioned above, McClellan has characters in his book that operate on at least three levels of power. I would classify these tiers in the following way. 2) Experienced Characters with Minor Boon/Ability. 3) Characters with Extraordinary Powers. 4) Characters with Extraordinary Powers at Super Heroic Levels. With the exception of the God tier, more on that later, there are characters of deep narrative importance at every tier. In other words, there are characters I would classify as Player Character worthy at each of these tiers and McClellan does a great job of balancing them narratively. Interestingly, this dilemma is one of the things that makes Savage Worlds the perfect system for the game. At the first tier of power are characters like SouSmith and Ricard Tumblar. SouSmith is a boxer who gets hired as a bodyguard for someone at tier 2 and Tumblar is one of the most politically powerful characters in the world. These would be standard characters in a picaresque low-magic fantasy campaign. Adamat and Sergeant (later higher rank) Olem are paragons of the tier two characters. Experience wise, and skill wise, these characters are similar to tier 1, but they have something that sets them apart called a knack. For Adamat it's a perfect memory and for Olem it's the fact that he doesn't need to sleep. These characters can also use their "third eye" to see magic. Most of the "knacked" of the books are at tier 2, but there are some who are higher. Tier's 1 and 2 are the low fantasy tiers and tier 3 is where you really begin to see people separate in power. All "privileged" mages and many Powder Mages fall into this group. There are some Powder Mages at tier 2 and some at tier 4 to 5, but most are in the mid-tier 3 range. These are characters who have the same number of skills as other characters, but who also possess magic abilities that allow them to destroy buildings with the wave of a hand. I initially wondered whether Savage Worlds' basic magic system could emulate "privileged" mages, but after comparing the dice of damage from a cannon blast (3d6+1 HW on pg 65 of the Deluxe Explorer's Edition) with that of Burst (2d10 HW) and Blast (2d6 or 3d6 HW), those concerns went away. The Burst spell has destructive power slightly less than a modern 20mm cannon and Blast has slightly less power than a medieval cannon. While neither is going to tear apart a modern Abrams tank, they both will make quick work of a Jeep or medieval building. There are a number of characters at this level of power in the book. Tier 4 characters are like tier 3 characters on steroids. Where a standard "privileged" mage can make short work of the facade of a house, a "predeii" can lay waste to the entire building and bullets bounce of their skin without the aid of a magic shield. Similarly, the Powder Mage Taniel can withstand the assaults of a predeii and amplify his strength and agility to levels beyond that of mere mortals. The Gods themselves come in at tier 5. I won't go into detail about the Gods of The Powder Mage trilogy, but I will say that they are a key focus of the conflicts in the books and that they are not so far removed from tier 4 as to make them uninteresting. Whether some other characters fall in at tier 5 I'll leave for you to discover. 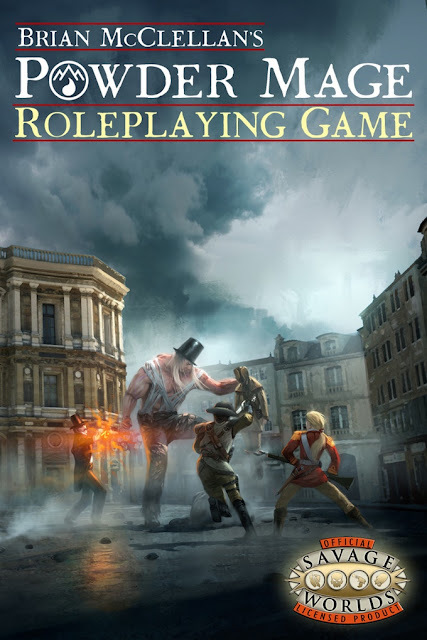 One of the things that becomes immediately clear as one reads Brian McClellan's Powder Mage Roleplaying Game is that the author himself has written much of the content. As a sourcebook discussing the history of the world and giving you a rich sense of place in order to set your games, this book is invaluable. Based on this content alone, I would recommend this book as a purchase for gamers and non-gamers who are fans of the series. McClellan's presentation of the setting is as readable as the fiction and the team has selected some excellent artists to capture The Powder Mage setting. If you want to know the state of the world after The Powder Mage trilogy, then this is the place for you. If there is any place where Powder Mage fails, it is as a role playing game book. While the lore is all there to inspire play, there aren't enough mechanics to make this book as useful as it could be. Alan Bahr, who is a very good designer and who is on an absolute tear when it comes to putting out good books lately, dropped the ball a little bit here. While he does provide some of the new rules one expects in a Savage Worlds rpg setting, new Background Edges for example, there are some weaknesses in these examples and some major holes in the book. After a very strong beginning, a discussion of the goals of good gaming and how to use the X-card in your games, the character creation session begins to peter out in the background edges section as it tries to adapt the Powder Mage archetype to the Savage Worlds rules. In doing so it attempted to create a new subsystem rather than fit the archetype within the existing subsystems Savage Worlds had to offer. In this particular case, the character reads more like the Gunslinger from Pathfinder/Critical Role and less like a Powder Mage. Bahr and McClellan might have been better served to use the Super Powers Companion or see how the standard magic system fit with the archetype. Given the power tiers above, I think that most Powder Mages are easily represented by the standard magic system and that outliers like Taniel are better represented using the Super Powers Companion. The same would be said of predeii and the Gods. That is a mere disagreement of design, and is a minor one at that. Bahr and McClellan's point system for Powder Mages does work, and well, even if it's not how I would do it. If that was the largest failing of the book, I wouldn't have mentioned it in the first place. Since it is actually the smallest flaw, I did choose to point it out. If that's the smallest flaw, then what is the biggest one? 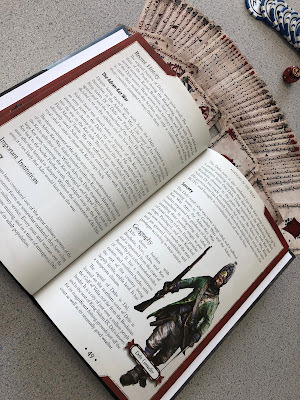 The biggest flaw is that as useful as the book is for players and book fans, having rules for character creation and a detailed gazetteer, it isn't as useful as it needs to be for game masters. One of the things that Savage Worlds game masters have been spoiled by is how the game's Fast, Furious, and Fun mantra has influenced how useful the books are to GMs with only small windows of prep time. Pick up any official Savage Worlds world book and you'll find quick and dirty adventure generators, a short adventure made of linked events, and enough NPCs to make a short campaign. This is what Brian McClellan's Powder Mage Roleplaying Game lacks entirely. While the game does include a couple of very fun, and easy to start a campaign, short adventures, it completely lacks a bestiary or the quick and dirty adventure generators one would find in The Goon, Necessary Evil, 50 Fathoms, etc. Worst of all, the book entirely lacks statistics for "Wardens" of either the standard or "black powder" variety. Given how ubiquitous Wardens are as opponents in the books, and the fact that there is a Warden on the cover of the role playing game, this is a pretty large drop of the ball. I had high hopes for this game, and backed it at the $65 level, but it did not live up to those expectations. Does this mean that it's not worth a purchase? Not at all. For the setting material alone, this book is well worth the price of at least the pdf. What this book needs is a couple of pdf supplements written just for GMs. They don't have to be long and could be limited to a bestiary and adventure generator, but they would really fill out the holes in the initial release. It's 85% of were it needs to be as a game and 110% of where it needs to be as a sourcebook.